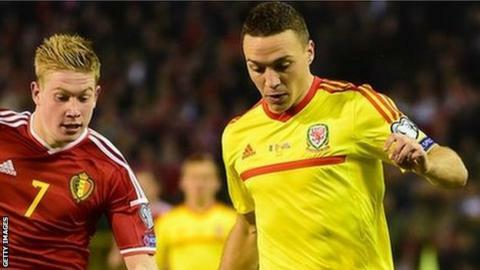 Wales defender James Chester is set to miss Thursday's Euro 2016 qualifier against Cyprus with a hamstring injury. The West Bromwich Albion centre-back could return in time for Sunday's match with Israel in Cardiff. Another injury doubt, Hal Robson-Kanu, is likely to play in Nicosia after the Reading forward returned to training. "He [Robson-Kanu] looks strong, fit. But tomorrow [Thursday] is too soon for James so we're looking at the weekend," said Wales boss Chris Coleman. "With the bodies we've got, we've got choices. "Luckily for us at the minute, one door closes and another one opens. There's good depth there." West Ham centre-back James Collins is one of the defensive options available to Coleman, having deputised for Chester in the 3-0 win against Israel in March. Defender Collins was a late arrival at the training base following the birth of his son over the weekend but has since taken full part in training. Uncapped Charlton Athletic left-back Morgan Fox received a late call-up to join the squad. The 21-year-old, who has seven Under-21 caps and was on stand-by, travelled out separately on Wednesday night. Wales arrived in Cyprus knowing that victory will put out them on the brink of qualification. Another three points in the following game at home to Israel on Sunday will send Wales through to France, securing a first appearance in the finals of a major tournament since the 1958 World Cup. But Coleman insists Wales are not looking beyond Thursday's match against Cyprus. "We've never ever discussed the second game, what's at stake," he added. "This is our own path we're not treading down anyone else's, so we have to look after our own business." The top two sides from each group qualify automatically from Group B, with leaders Wales holding a three-point lead over Belgium. Cyprus and Israel remain in contention, though, with nine points apiece. Bosnia-Herzegovina are a point further back. Gareth Bale has scored five of Wales' eight goals in the qualifiers to date, and he met up with the squad having scored twice as he played the full 90 minutes of Real Madrid's 5-0 win over Real Betis in La Liga. And Swansea City pair Ashley Williams and Neil Taylor were given time off on Monday to recover from Sunday's Premier League win over Manchester United. Coleman is without midfielders Joe Allen, Emyr Huws and Jonathan Williams because of injuries, with David Vaughan also unavailable for family reasons. Sunderland full-back Adam Matthews has also been ruled out with injury, while Newcastle United defender Paul Dummett has not been included because of a lack of match fitness.